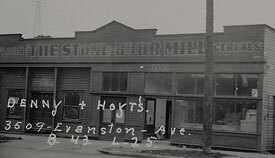 "Fremont's Connection to the Klondike Gold Rush, 1897-1898": There will be a month long display of stories, photographs, and maps presented by the Fremont Historical Society in partnership with the Seattle Public Library which will focus on the lives of Albert J. and Clara Goddard, early Fremont residents and owners of Pacific Iron Works. In 1898, the Goddards had two river steamboats shipped to Skagway, AK, in sections. The sections had to be hauled by relays over the pass and assembled on Lake Bennett. When the ice broke up, they became the first to pilot a steamboat to Dawson -- a distance of over 400 miles. Saturday, May 12: Please join us for a reception from 11:00 am to 12:00 pm and an opportunity to chat with Historical Society members about the display. At 12:00 pm, there will be a program which will include a showing of Finding the A.J. Goddard. The documentary tells the story of the steamboat (which the Goddards sold in 1899) sinking in Lake LaBerge during a 1901 storm, and the search for, and finding of, the shipwreck in 2008. Also, on a historic maritime topic, Richard Miller, the project manager for the Northwest Seaport's 2017 haul out of the Arthur Foss, will give a presentation. He will cover its 129 years of service in Alaska, the Columbia Bar, Puget Sound, then in the South Pacific during World War II, and a major part in an old movie. The Arthur Foss is the oldest wooden tugboat in the U. S. that is still afloat. Richard will also talk about the scope and findings of the haul out. Light refreshments will be served. Free. See below for further details on National Preservation Month. Each May the Fremont Historical Society creates a display at the Fremont Library featuring historic and current photos of ten historic buildings in Fremont, celebrating preservation and adaptive reuse of the buildings as part of this nationwide event put on by the National Trust for Historic Preservation. Volunteers from the Fremont Historical Society research the history of the buildings and interview the property owners for additional background. A public reception is held at the beginning of the month and the display continues through the end of May. This is an annual summer tour conducted by the Fremont Historical Society, offered on a Thursday evening in July or August. 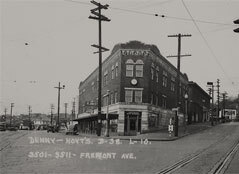 The tour meets outside the historic Fremont Car Barn (now Theo Chocolates) at N. 34th/Phinney Ave N., proceeds east on N. 34th to Woodland Park Ave N. and north on Woodland Park Ave N. to N. 39th St. Tour lasts about 1- 1 1/2 hours and features stories and historic information/photos about the historic streetcar system and historic buildings/locations along the route. This tour is held in June or July each year and covers public art installed in Fremont from the 1970s to the present. The tour is led by a founding member of the Fremont Arts Council and Fremont Historical Society. The Fremont Historical Society periodically holds informal walking tours to explore the commercial and residential areas of Fremont. Like all other tours and events sponsored by the Fremont Historical Society, these tours are open to the public. The Fremont Historical Society periodically presents lectures on the history of Fremont. These have included an oral history of an early Fremont business, the Fremont Drug Company, presented by the owner's grandson, an oral history interview of Armen Stepanian, the former "Mayor of Fremont", and a presentation on the history of B.F. Day Elementary School. All tours and events are free and open to the general public.